Amy Kazymerchyk is a independent curator. She has programmed for VIVO Media Arts Centre, the Signal + Noise Media Arts Festival, Vancouver Queer Film Festival, and DIM Cinema at the Pacific Cinematheque. 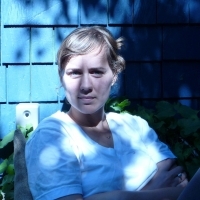 Amy has contributed to Artist-Run Culture in Vancouver in numerous capacities; and continues to support both institutional and non-institutional artist run initiatives and projects.